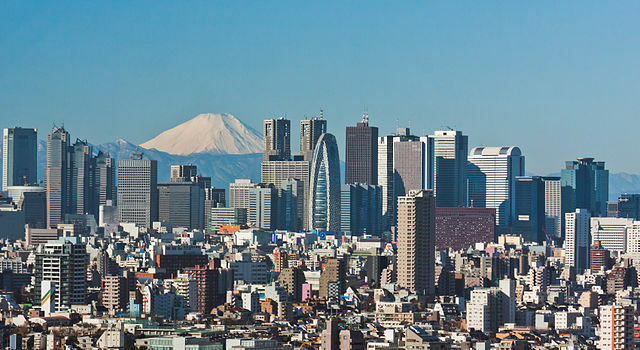 Mount Fuji can be seen from all over Tokyo on a clear day – but as there aren’t many of them in Tokyo, you could live there for years without ever seeing a view like this. By far the most famous volcano in Japan, and at 3,776 metres also the country’s tallest mountain, Mount Fuji is only 100km west of Tokyo. On clear days it is visible from all over the metropolis, and has long been a favourite subject for Japanese artists because of its graceful and almost perfectly conical shape. To followers of Shintoism it’s also a holy mountain, and since 1609 the summit has been owned by the Fujisan Hongu Sengen Taisha shrine. Mount Fuji’s beauty masks its ferocious power, and the periodic reigns of terror that it inflicts on the surrounding area. It is right at the point where the Philippine, Eurasian and North American tectonic plates meet, so it has a plentiful supply of geological energy. While it has been dormant for over 300 years, it has erupted sixteen times since its first recorded eruption in 781 AD, and it’s only a matter of time till it erupts again. Mount Fuji sits all on its own, surrounded by relatively flat land. This photo was taken by an astronaut on the International Space Station. The most recent eruption was in 1707, and lasted for sixteen days. Nearby areas were buried three metres deep in ash, and several villages were completely destroyed. Rocks rained down over surrounding towns and cities, and Tokyo was blanketed with a covering of ash. This gives a good indication of what to expect from the next eruption, which is bound to be a major disaster for Japan. Volcanologists should be able to provide enough warning to allow for safe evacuation of the surrounding area, but the economic damage from an eruption could be as high as ¥2.5 trillion. 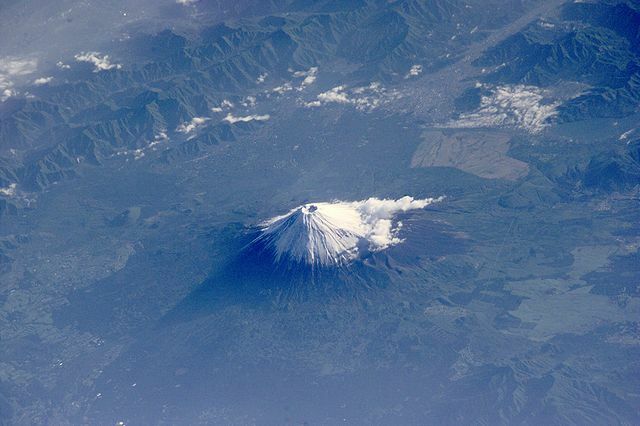 300,000 people climb Mount Fuji every year, and many more make trips to nearby national parks to see it from up-close. If climbing is your thing, then you need to visit in July or August – this is the official climbing season. The mountain is usually free from snow at these times, and the weather relatively mild (though it can still get below zero at the summit). If you want to climb outside of this time, then you need to be much better prepared, and to have plenty of climbing experience. Climbing is very perilous and therefore strongly discouraged between October and May, when temperatures can drop below -40°C and high winds have occasionally blown people right off the mountain. One of the many mountain huts along the trails up Mount Fuji. Here you can buy noodles, curry and hot drinks. If you climb during the official season, you don’t really need any special experience or equipment – just a good general level of fitness and appropriate cold-weather gear and hiking boots should do. You can actually drive (or take a bus) more than halfway up the mountain – only real purists hike all the way from the bottom. There are four roads up the mountain, each leading to a different trail. From the ends of the roads, you can reach the summit in four to ten hours, depending on your fitness and which route you take, and the descent takes around two to six hours. Most people break their journey for a few hours at one of the many mountain huts, as not only does this help you to get a rest, and maybe a bit of sleep, but it also minimizes the risk of altitude sickness. The highlight of the climb is usually considered to be seeing the sunrise from the summit, and so most people aim to reach the top early in the morning, often by staying in a mountain hut overnight (around ¥7,000 with two meals). In the climbing season, sunrise is between 4:20am and 4:50am. As the trails are well marked, climbing at night is no problem, and is actually when the paths near the top of the mountain are busiest. Now if you’re looking for tranquil nature and serene beauty, you’ve chosen the wrong mountain. Expect to find thousands of fellow climbers along the way and at the summit. If you’re a fast climber you’ll need lots of patience, as you’ll have to stick to the pace of the person in front most of the way up, and may even have to queue up to get past some pinch-points. Even at the summit, convenience rules. 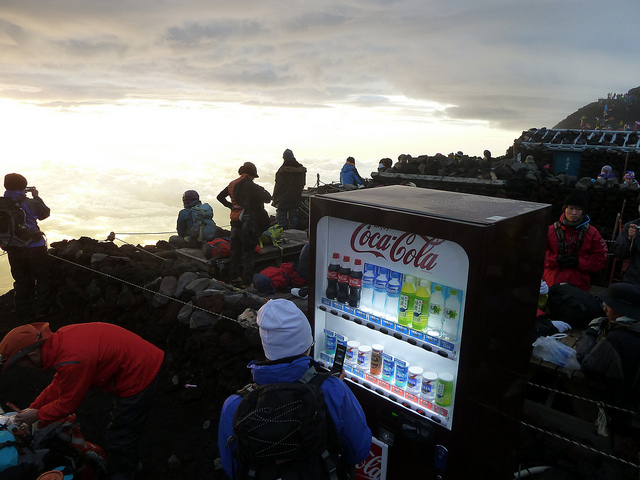 This just might be the world’s highest vending machine. The climb is a long hard slog, along a path that zigzags up the mountain. Depending on the route you choose, the trail may start off passing through flowery meadows or forest, but the landscape soon becomes rocky and barren. As you get higher, the trail gradually becomes steeper and the air thinner. 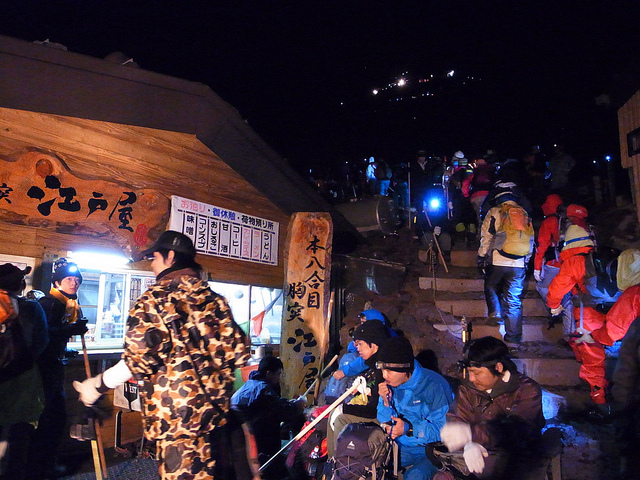 There are mountain huts selling food and drinks at several points along the trails, but as you get higher so do the prices – reaching about ¥400 for a can of drink at the summit. 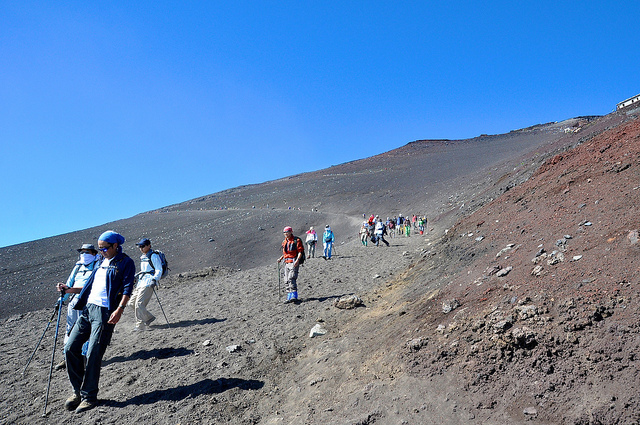 The trails all converge on the volcano’s long dormant summit-crater, which is 250 metres deep and surrounded by eight peaks. It takes about an hour to hike around the crater, which is some 500 metres across. Even right at the top there are plenty of facilities – including a post office where you can have your postcards stamped to prove to your friends that you made it all the way up. Being Japan, there are even soft-drink vending machines up here! If it’s a clear day you can get a magnificent view, but be warned that Mount Fuji is often blanketed in cloud, so be prepared to be disappointed. Early morning is the best chance of getting a clear view – another reason for arriving just before sunrise. On the way down again, trekking through the bleak and barren landscape. To be honest, Mount Fuji is much more attractive from a distance than close up. The history of past eruptions means that its surface is made up of grey and red volcanic rock, ranging in size from boulders to dust. The real attraction of climbing the mountain lies in the achievement, and the fun of taking part in a challenge together with a legion of like-minded individuals. During the climbing season, the start points of the trails are well-served by public transport, and numerous companies offer climbing tours – usually including a stop at a hot spring for bathing on the way back. You can find an excellent comprehensive guide to the various climbing options here. If you’re not visiting in season, or just want to take things a little easier, you could take an excursion to Hakone to the south-east, or to the Fuji Five Lakes to the north, both resort areas famous for their views of Mount Fuji. If you don’t have time for any of these options, then you should at least be able to get a good view from the train if you travel between Tokyo and Osaka or Kyoto.